Ziran means “nature” in Chinese. The full name of our school Ziran Dao Taijiquan Wuguan 自然道太極拳武館 translates into "Natural Way T’ai Chi Fist Martial Hall" or Ziran Martial Arts(Natural Martial Arts) for short. There are a number of meanings imbedded in the name, but most importantly it is intended to serve as a constant reminder that we should be living and training according to our natural tendencies and in balance with our internal, external, natural and societal environments. I have had an image in my mind for several years. It was of a dragon climbing in a spiral around the Sangai Matsu, the three-tiered pine. The Sangai Matsu is the family crest of my teacher Grand Master Kaneiki Iwao and is also is the symbol for Ogoshi Musoryu Jujitsu, the school that was passed down to Kaneiki Sensei by his grandfather, father, and uncles. My idea of a symbol showing a dragon climbing upward in a spiral around the tree was inspired (I think) by a gift that my teacher gave me of a cast bronze statue of a dragon coiled around a sword. 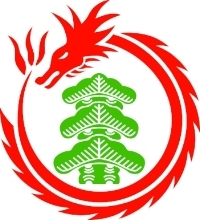 I thought the tree and dragon image would be a perfect logo and symbol for our school. It imbedded the crest of our family lineage and instilled it with the energy of the dragon which is traditionally perceived as a force of nature. Several years back, a friend of mine named Joe Domelewski created a logo for our “Natural Dragons” program. Natural Dragons was a weekend extension of our gongfu school. It was a synthesis of martial arts, outdoors education, and organic farming. Joe’s logo was very nice and included a dragon soaring around the Sangai Matsu to form a ring. I had played around with this idea for a bit after deciding that my original idea of the dragon climbing the tree was too complex for a logo. Joe brought my rough concept into a refined and professional form that I was very happy with. We did the Natural Dragons program for a season and then opted to postpone the program until we had built more infrastructure. We are almost there by the way. (The classroom is fully built and the solar panels are on the roof! Next I need to install fencing and start to bring in top-soil.) I’ll address that more in later blog posts. Kaneiki Sensei liked Joe’s logo very much and adapted it into a design for the school shirt that my classmates in Japan wear. More recently, my friend, Edison Lee of Move Foundry came on board as our videographer and web designer. He took on the task of designing the logo according to my original idea. Within the logo, the Sangai Matsu tree symbolizes both the tree of life and the transmission of family knowledge from one generation to the next. The bottom tier represents those who have come before. The middle tier represents the current generation of practitioners. The top tier represents those who will receive our martial arts in the future and carry it on. A dragon has climbed the tree and has spiraled its way up to the top. The dragon represents the infusion and the transmission of the spirit and skill of gongfu and budo (martial way) from the past to the present and to the future. Furthermore, it represents qi (intrinsic energy) traveling through the body as a spiral energy. You might also notice that there is a Z for “Ziran” imbedded in the logo. Edison claims that it just worked out that way. Coincidence? I think not! This is the logo image that I have been visualizing for a long time. Edison warned me before we started that it was going to be pretty complex. I told him “let’s go for it.” I am delighted to say that thanks to his creative efforts and tenacity in refining the design until we were both thoroughly satisfied, my good friend Edison Lee of Move Foundry has nailed it again! Tom and I were having some deep conversation about what should be our first blog entry. We decided that it should be our school creed and precepts. This is what we strive to be all about. 1. I am a Martial Artist and Scholar. 2. I seek mastery through moderation. My journey towards excellence is unending. 3. I strive to be a person of positive character. I treat others with respect, courtesy, and benevolence. 4. I discipline my thoughts and behaviors. I take responsibility for my actions. 5. I complete my daily tasks purposefully, with correct action, pride and humility. 6. I keep my eyes open to see the truth and listen with an open heart. 7. I am mindful to nurture wellbeing through the balanced cultivation of mental, physical, spiritual and environmental health. 8. I maintain a spirit of gratitude. I am truly respectful and courteous at all times. I choose my words carefully and am honest and forthright. I do not belittle others. I choose kindness and courtesy over indifference and disdain. I develop myself mentally, physically, morally and spiritually through hard work, reflection and correction. I eliminate harmful behaviors, attitudes and actions and cultivate positive attributes. I study the meaning of virtue and carry the obligation to live virtuously. If I fail to do so, I dishonor my parents, my teacher, and my school (Dojo). I am careful to affiliate with people who share these values. I develop self-discipline, self-control and responsibility in thought, deeds and words in order to bring out the best of myself and others. Only I am responsible for my actions, and I do not blame others for my shortcomings. I think before I act knowing that life, my own and that of others, is precious and cannot be replaced. I act with humility. This is pride without arrogance. I do not show off or think myself superior to others, andI strive to rid myself of vanity. I work to live in harmony with nature and my environment so that I may cultivate health and contribute positively to the community and society for the present and future generations. I take action with courage and restraint and the judgment to do what is right. Benevolence is my manner and my first choice. I do not act violently, abusively or impulsively. A violent action can never be undone. I understand that true courage will allow me to face my deepest fears and challenges in life, with positive action physically, mentally, and spiritually. I strive to be aware of my surroundings, society and myself. I hone my perception and study deeply. I learn from experience so that I do not repeat my mistakes, and I strive to use wisdom in decision making. Power without perception is without value to me. I am strong in my path and do not give up even when there seems no way to go on. 10. Cultivate the spirit of generosity and gratitude. I know that giving is better than receiving, and I nourish my spirit of gratitude.